In 22 simple yet profound reflections, seasoned minister Mark Belletini explores the many and varied forms of grief. In twenty-two simple yet profound reflections, seasoned minister Mark Belletini explores the many and varied forms of grief. His honest, poetic essays serve as a prism, revealing the distinct colors and manifestations of grief in our lives. He addresses the way we respond to loss of people in our lives, loss of love, loss of focus, and loss of the familiar—understanding that grief is as much a part of our lives as our breathing. Belletini uses specific and personal stories to open up to the universal experience. 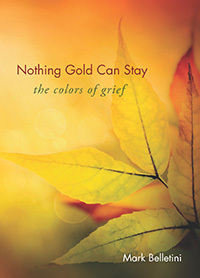 Nothing Gold Can Stay is a gift of awareness, showing how the shades of grief serve our deepest needs. Although certainly children experience grief . . . these reflections are written primarily for those who have been reflecting on loss in their longer lives as I have been. I record times of great personal sadness, but I have not found sadness during the writing of these reflections, only a gratefulness that grief has so many rich colors, shades and hues; and that, (in general, of course) all of these colors serve our deepest human needs and articulate some of the best meanings of what it means to be human. Nothing to be ashamed of, explained away, hidden or denied. Refusing to embrace grief in all of its richness is like deciding to hold our breath to live more fully, or pretending we are not thirsty when we are. It really makes little sense to avoid this gift, which I might even call a spiritual gift or path. Grief can be seen, finally, as a gift that blesses and illumines our mortality, and our very existence in this world which the human race is depleting each and every day, never once grieving the lost of species, of whole ecologies, of cultures that perish when the last word of a language of which we have never heard dies on the lips of the old woman who is the last of its speakers. Grief, I’ve come to see, is not a single feeling in and of itself, but a whole symphony of feelings, some seemingly deeply dissonant from each other. But then, great symphonies often grow richer with the incorporation of dissonance within the music . . . so that the remarkable resolution at the conclusion seems all the more a gift. I’ve certainly struggled with aspects of guilt . . . especially wondering if I might have taken more time off from work to be with dying friends, especially the ones rejected by their families. But guilt is a feeling, not rational judgment. In the AIDS days in the San Francisco Bay Area, if I had taken time off work to spend more time with all my friends and acquaintances who were dying, I wouldn’t have been able to work at all. Nor have a moment to myself. The fact is, all of us who went through that era in the Bay Area or any place else did a lot, and more, gladly giving of our time for those we loved. But each of us are finite beings, with physical and temporal and even emotional limits, and trying to deny that remains foolish. "Mark Belletini brings his tears, his passion and his deeply literate quality of beauty to these reflections on grief. He gives us permission to grieve fully and share our grief as a tribute to our Love. This book will inspire deep conversation among us. It is a gift." Reading Mark Belletini's reflection on "Grief and Animals," I thought of Maggie the border collie, who, sensing my desolation when my sister was dying, lavished her attention on me. I read on and broken friendships came to mind. As memories of family and friends and of other kinds of deaths caught me by surprise, I kept stopping to cry and remember and say "of course." Take your time reading this book. It needs to be savored. It is important for what it will remind you of, and for creating a space and moment in your life to grieve again so you can discover grief's companions, joy and gratitude."